A friend of mine is constantly talking about Richard Stark's PARKER, so when I saw a bunch of these graphic novels at the comic shop, I grabbed one at random to see what it was all about. Darwyn Cooke is a fantastic writer, and while I can't say what kind of job he does translating Stark's work (because I haven't read the source material), I can say that, objectively, he does a great job with this story. He brings tense, crime fiction to life in a compelling and engaging way. The art and color is A friend of mine is constantly talking about Richard Stark's PARKER, so when I saw a bunch of these graphic novels at the comic shop, I grabbed one at random to see what it was all about. Darwyn Cooke is a fantastic writer, and while I can't say what kind of job he does translating Stark's work (because I haven't read the source material), I can say that, objectively, he does a great job with this story. He brings tense, crime fiction to life in a compelling and engaging way. The art and color is wonderful, and evokes the period beautifully. When we’ve hit a point where Hollywood thinks that Jason Statham would be the perfect guy to play Parker in a movie, maybe it’s best that we all just stick to Darwyn Cooke’s graphic novel adaptations of the Richard Stark books to get our visuals of what the professional thief’s stories would look like. This one adapts The Score in which Parker puts together a crew to take over and loot a small isolated mining town. As he did in his versions of The Hunter and The Outfit Cooke uses the text from th When we’ve hit a point where Hollywood thinks that Jason Statham would be the perfect guy to play Parker in a movie, maybe it’s best that we all just stick to Darwyn Cooke’s graphic novel adaptations of the Richard Stark books to get our visuals of what the professional thief’s stories would look like. This one adapts The Score in which Parker puts together a crew to take over and loot a small isolated mining town. As he did in his versions of The Hunter and The Outfit Cooke uses the text from the book along with his artwork to tell the story, and as with the other ones, he does a first rate job of it. This one has a black and yellow color scheme with that retro style that fits the Parker stories perfectly. Cooke also incorporates clever touches like showing us a map where each character is during the takeover of the town. Particularly nice is how he draws scenes that illustrate what’s going on in the imagination of the whimsical Grofield as they pull off the job. So if the thought of watching a so-called Parker movie featuring Statham and J-Lo depresses you as much as it does me, grab one of these adaptations and replace that mental picture with Cooke’s brilliant work. I read this last night while also watching the Olympics with my family, which makes for a really funny juxtaposition, since the Olympics is all sentimental storytelling, rooted in the back-stories of all the largely American participants (if you are watching it as I am, in the U. S.), and Richard Stark's--one pseudonym for Mystery Writers of America Grand Master Donald Westlake--Parker is the hardest-boiled detective you ever met, the opposite of sentimental. Westlake adapted Jim Thompson's nove I read this last night while also watching the Olympics with my family, which makes for a really funny juxtaposition, since the Olympics is all sentimental storytelling, rooted in the back-stories of all the largely American participants (if you are watching it as I am, in the U. S.), and Richard Stark's--one pseudonym for Mystery Writers of America Grand Master Donald Westlake--Parker is the hardest-boiled detective you ever met, the opposite of sentimental. Westlake adapted Jim Thompson's novel The Grifters into an academy-award-winning screenplay, so if you've seen the film you know the territory, though Parker's world has even less sense of humor; Parker never smiles once. And of course, the ladies are attracted to him even if one of them calls him ugly. This is the third in the Parker series adapted beautifully by Darwin Cooke, in retro-sixties art and color, very hip and lean and mean. The story is of a score, the biggest and most improbable one Parker--a lifetime criminal, a thief--ever did, taking a town at night, with an outfit of twelve wise guys. In the two previous books, everything went perfectly. In this one, mistakes are made, and Parker knows it from the beginning but surprisingly goes through with it, anyway. He doesn't thoroughly research Edgars, the guy who wants to take this town down, he has too many variables to control, he goes soft and allows one of the guys who picks up a girl to take her along instead of offing her (which as a detective/thriller reader, you know he had to do, but there is a slight soft spot in this Parker, he likes the dames). Every single time I put down one of Darwyn Cooke’s Richard Stark adaptations, I tell myself, “Man, I really need to read those Parker books”. Not only do they come with solid recommendations from many of my trusted friends, they’re right up my alley. Disgruntled con-man with some serious anger issues? Give me all the books. Parker’s general rule states that if a job needs more than five people, it’s not a job. So imagine his reaction when someone proposed a heist requiring more than twenty-five b Every single time I put down one of Darwyn Cooke’s Richard Stark adaptations, I tell myself, “Man, I really need to read those Parker books”. Not only do they come with solid recommendations from many of my trusted friends, they’re right up my alley. Disgruntled con-man with some serious anger issues? Give me all the books. Parker’s general rule states that if a job needs more than five people, it’s not a job. So imagine his reaction when someone proposed a heist requiring more than twenty-five bodies. 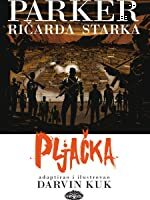 Scaling things down to a modest twelve crooks, Parker joins in with a rag-tag group of criminals recruited by a mysterious newbie, Edgars, with a plan to rob an entire town. Edgars is upfront about his displeasure with the quarry city and makes it known that the job has a lot to do with personal reasons – another red flag for Parker. Parker admits that he’s in need of a challenge and with a take of this size – roughly a quarter of a million – it’s hard to say no. I often wonder how objective I would be with the material if I had read the original books. I can't attest to how accurate the adaptations are, all I can say is how much fun they are to read. The artwork is gorgeous and the colors, while subdued, find a way to do so much with varying shades of only one predominate color. I'm a big fan of Cooke's approach to this project. The series is very much a "show, don't tell" adaptation as there are large sections of storytelling without dialogue. I guess that's the point. If you wanted tons of words encasing the beautiful imagery, you might as well read the books. I’m the perfect audience for these books as I’ve never read a Richard Stark/Donald Westlake novel about Parker but I love Darwyn Cooke, I like crime stories and looooove comics, so mixing all that up and serving it to me is gravy every time. I will read a Parker novel by Westlake one day but for now, The Hunter, The Outfit, and this one, The Score are perfectly enjoyable by themselves. Parker is his usual tough-guy self as he gets drawn into a scheme to rob an entire town, a small mining town in I’m the perfect audience for these books as I’ve never read a Richard Stark/Donald Westlake novel about Parker but I love Darwyn Cooke, I like crime stories and looooove comics, so mixing all that up and serving it to me is gravy every time. I will read a Parker novel by Westlake one day but for now, The Hunter, The Outfit, and this one, The Score are perfectly enjoyable by themselves. Parker is his usual tough-guy self as he gets drawn into a scheme to rob an entire town, a small mining town in the middle of nowhere, in a single night. He assembles a team of expert thieves to assist in the raid and they plan meticulously - but of course things don’t go according to plan, neither are they what they seem. My favourite book of the series so far is The Outfit though The Score is a close runner up and it’s told in a more straightforward way, unlike The Outfit which made great use of various comics styles to tell the story. 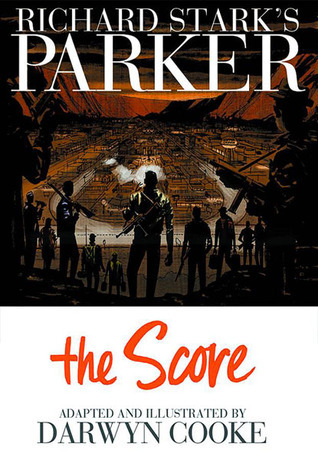 The Score is also the first Parker book where thing have gone wrong - in previous titles, Parker and co. have made a plan and pulled it off perfectly. Here, Parker finally encounters trouble and has to deal with complications as they arise, leading to a more tense and exciting story overall. The one criticism I would have is how few people the crew encounter in the town - even if there is a curfew and it’s set at night, they meet just one person on the streets? In the entire town? Hmmm. Darwyn Cooke's previous adaptations of Richard Stark's 'Parker' novels (The Hunter & The Outfit) were faithful to the source material (Cooke had even included pertinent elements of The Man With The Getaway Face in the 'Outfit' adaptation) and it was a real pleasure for me to have one of my favourite artists illustrate some of my favourite crime stories. This book continues the trend. What initially struck me was the choice of colour for the art. In the previous volumes, we had black & wh Darwyn Cooke's previous adaptations of Richard Stark's 'Parker' novels (The Hunter & The Outfit) were faithful to the source material (Cooke had even included pertinent elements of The Man With The Getaway Face in the 'Outfit' adaptation) and it was a real pleasure for me to have one of my favourite artists illustrate some of my favourite crime stories. This book continues the trend. What initially struck me was the choice of colour for the art. In the previous volumes, we had black & white art with a third colour used for shading. The Hunter had a dark bluish-green, and The Outfit had purple. This book uses a bright orange. But guess what - it works. Like in the first two adaptations by Cooke, there are some departures from the source material, but all the elements that I loved about The Score have been faithfully translated to the comic book page and make this another successful adaptation by Darwyn Cooke. Cooke's adaptation of Slayground is next. Not nearly as good as Darwyn Cooke's adaptations of the Parker novels The Hunter and The Score. It was just as skillfully adapted as a graphic novel, with a sparse monochromatic but propulsive drawing and minimalist writing. I think, without having read it directly, that the problem is the plot of the underlying novel it is adapting. The Hunter and The Outfit both have a higher level of double-crossing, more varied settings, and an almost epic struggle of Parker as a solo criminal against "The O Not nearly as good as Darwyn Cooke's adaptations of the Parker novels The Hunter and The Score. It was just as skillfully adapted as a graphic novel, with a sparse monochromatic but propulsive drawing and minimalist writing. I think, without having read it directly, that the problem is the plot of the underlying novel it is adapting. The Hunter and The Outfit both have a higher level of double-crossing, more varied settings, and an almost epic struggle of Parker as a solo criminal against "The Outfit" as a wide-ranging organization with tentacles in everything. In contrast, The Score is more of a standard caper story as Parker is presented with an idea for a score, assembles a crew, procures weapons, cases the site, moves in, it goes partly wrong, and then they leave and hideout. Nothing more, nothing less. Great adaptation. I loved the scenes when Edgar tries to get his revenge on Copper Canyon. The is the best novel in the series so far which i read. The sketches and the yellow shade. Simply great. Really the graphic presentation just made it great otherwise i wonder how different could it be to read the book as this carried a simple hit job. This was my third book in the Parker series of graphic novels, although I'm not sure it's the third book in terms of order. In any event, after the dazzling "The Hunter" and the mystifying misfire of "The Outfit," "The Score" is a huge comeback - maybe the best of the three. "Slayground" is next, and then ... well, it's not clear to me that there are any additional titles in the series. That already makes me sad. This is the third book that Darwyn Cooke adapted from Richard Stark's Parker novels. I thought this book was the most fun of the three graphic novels that Darwyn Cooke did. The fun in this case is the planning and execution of a robbery and because of the type of robbery this is there is all kinds of side stories that keep the story moving and interesting. The reader also gets to see a glimpse into some of the characters we have meet that Parker does his jobs with as well as finding out even mor This is the third book that Darwyn Cooke adapted from Richard Stark's Parker novels. I thought this book was the most fun of the three graphic novels that Darwyn Cooke did. The fun in this case is the planning and execution of a robbery and because of the type of robbery this is there is all kinds of side stories that keep the story moving and interesting. The reader also gets to see a glimpse into some of the characters we have meet that Parker does his jobs with as well as finding out even more about Parker. Though more is not a large volume of information when it comes to this character. Over all this was the most straight forward and best story that really shows that Parker as a criminal in no uncertain way. If you like crime capers this is something you will enjoy. Highly recommended. Cooke's gorgeous retro art fits the theme and feel of the story perfectly, but the scope was so big and the pages so few that it got confusing at times. The Score is the biggest job Parker has ever taken on. He brings in a lot of great characters to help him do it and the plan and its realization are brilliant. The problem is that so many things happen with so many characters (which are sometimes hard to distinguish) that I had to page back a couple of times to see who was where. Copper Canyon, North Dakota: a small mining town with a curfew, backed into a canyon, with only one route in and out. If Parker, a brutal criminal, and eleven of his closest criminal associates, can overtake the town’s police station, firehouse, and phone company, they can seize the town’s payroll from the banks, and any other loot they can grab from the local jewelers, loan companies, and department stores overnight and be gone before the curfew lifts, clearing a quarter mil. Of course, things d Copper Canyon, North Dakota: a small mining town with a curfew, backed into a canyon, with only one route in and out. If Parker, a brutal criminal, and eleven of his closest criminal associates, can overtake the town’s police station, firehouse, and phone company, they can seize the town’s payroll from the banks, and any other loot they can grab from the local jewelers, loan companies, and department stores overnight and be gone before the curfew lifts, clearing a quarter mil. Of course, things don’t go as planned. On the one hand, I still enjoyed reading this and the character of Parker. But this one was where I found myself thinking that maybe this is all a little bit much. Maybe that was the p On the one hand, I still enjoyed reading this and the character of Parker. But this one was where I found myself thinking that maybe this is all a little bit much. Maybe that was the point? To cast the reader's enjoyment of somebody else's violent revenge in a different light, by implicitly using Parker's revenge in a previous book as a foil? This review originally appeared on my blog, Shared Universe Reviews. Parker: the Score is the third book in a series of comic adaptations of Richard’s Stark’s crime novels by Canadian born Darwyn Cooke. I’m very impressed. Nearly 500 pages of comics and Cooke’s barely had a slip up. As always, when talking about plot elements and the overall execution of the book I refer to Cooke. Having not read any of the Parker novels I have no idea how much is taken from the series of novels. I imagine it’s This review originally appeared on my blog, Shared Universe Reviews. Parker: the Score is the third book in a series of comic adaptations of Richard’s Stark’s crime novels by Canadian born Darwyn Cooke. I’m very impressed. Nearly 500 pages of comics and Cooke’s barely had a slip up. As always, when talking about plot elements and the overall execution of the book I refer to Cooke. Having not read any of the Parker novels I have no idea how much is taken from the series of novels. I imagine it’s a lot but I mean no disrespect when omitting Stark’s name from my comments and reviews. It’s something I’ll have to address by reading a few of the novels. We meet up with Parker while he’s on a beach. He hasn’t done a job in six months. He’s not low on cash but boredom has settled in. There is a man who wants to organize a heist but he’s new to the game and needs help. This man, Edgars, presents his job to Parker and some of his friends (we’ve met two of them in The Outfit). Edgars plans to rob a town called Copper Canyon. While describing the job to the other thieves it becomes clear to them and clear to the reader that Edgars plans quite literally to rob the whole town. Parker’s friend, Grofield, is immediately intrigued. It takes Parker a bit longer but boredom and an exciting job leads him to decide to take the risk on this job. The straightforward plot, Parker and 11 other men plan and execute a job, becomes much more intriguing because Parker breaks his own rules: 1) do not work a job that requires more than four or five people because it becomes too complicated and therefore too risky, 2) if a job is too risky, cut your losses and walk away. We know he should walk away and we know there will be a negative outcome for Parker and his crew because he didn’t walk about but just like our anti-hero, we’re hooked. We’re glad he decided to take charge and plan the robbery. It’s refreshing that we’re reading about Parker dealing with a job for an entire book. So far we’ve read about him dealing primarily with the outcome of past jobs that have gone wrong. This time we’re along for the ride and we get to see the planning and the execution. Cooke experimented with style and storytelling in The Outfit and experiments a bit this time around as well. Grofield’s scenes are intercut with his strange imaginings he has comparing the heist to a group of soldiers undertaking a missing in a World War II setting. It works well, both visually as well as device to quickly show us what kind of person Grofield is. He’s obviously very good at his job, he really likes it but he’s arrogant and takes unnecessary risks. He lacks focus compared to many of the other thieves. The accent colour this time around is orange. This seems like a strange choice at first but it makes sense. It is strange because it’s not a dark colour. Crime comics and even police procedure comics tend to have a darker colour palette. I’m thinking specifically of Criminal by Ed Brubaker and Sean Phillips and Gotham Central by Greg Rucka and Ed Brubaker. Orange isn’t dark at all. I can’t help but think that Cooke had the gas station explosion in mind while choosing the accent colour for The Score. The impact of that page would have been lessened by the use of. The explosion in question was done using only the off-white colour of the page and the orange. There is no black at all and it looks the explosion is happening right in front of our eyes. Unlike the previous two adaptations, there are no flashbacks in The Score. The book concentrates on showing us the thieves at work and Cooke wisely gives things room to breathe. The book is not as dense as the previous two but it doesn’t feel slight because of it because Cooke tells it so clearly, so efficiently. Cooke keeps in mind that this is a very big undertaken and treats it as such. Also, because this is crime fiction we can expect something to go wrong. I knew something was going to happen but I couldn’t figure it out. I shouldn’t feel too bad though, Parker didn’t see it either. My only complaint for The Score is that the problems that arise are resolved rather quickly. Not only that but it’s a huge undertaking and it’s nice to see Parker working with a large crew. Not only that, but it wouldn’t be good crime fiction unless something goes wrong and part of the fun is trying to figure out what will go wrong. I’m not spoiling anything in saying the Copper Canyon job goes as wrong as it possibly could have gone. It’s a riveting how Cooke made it happen. One of the many reasons this is a great comic is the portrayal of the crew of thieves. Every single one of them have a way of dealing with the life they’ve chosen, they all have rules. Not everybody agrees with how things are done but everything body at least pretends to go along with it for the sake of the payoff. Parker is still the star of his own series but Grofield gives him a run for his money. The Parker books are a master class in mood and vibe. Every panel Cooke illustrates contributes to the world he is building and the stages he is setting. While story wise, The Score doesn't measure up with several other titles in this series it still gives the reader a front row seat for a master at work. I picked this up for £3 in a Waterstones bargain bin. What a bargain! A thoroughly enjoyable little heist story. Art by Darwin Cooke is fantastic as always. It's certainly made me want to check out the other 3 volumes Cooke did, as well as the original Parker novels (if I can find space in my ever more hectic reading schedule).